For other people with the same name, see Sam Phillips (disambiguation). 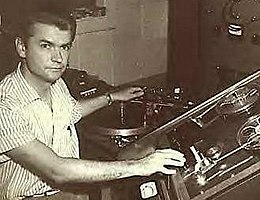 Samuel Cornelius Phillips (January 5, 1923 – July 30, 2003) was an American record producer who played an important role in the development of rock and roll during the 1950s. He was the founder of Sun Records and Sun Studio, in Memphis, Tennessee, where he produced recordings by Elvis Presley, Roy Orbison, Jerry Lee Lewis, Carl Perkins, Johnny Cash, and Howlin' Wolf. He launched Presley's career in 1954. Phillips sold Sun in 1969 to Shelby Singleton. He was an early investor in the Holiday Inn chain of hotels. He owned and operated radio stations in Memphis; Florence, Alabama; and Lake Worth, Florida. He advocated for racial equality and helped break down racial barriers in the music industry. Phillips was the youngest of eight children, born on a 200 acre farm near Florence, Alabama, to Madge Ella (Lovelace) and Charles Tucker Phillips. Sam's parents owned their farm, though it was mortgaged. The experience of hearing workers singing in the fields left a big impression on the young Phillips. Traveling through Memphis with his family in 1939 on the way to see a preacher in Dallas, he slipped off to look at Beale Street, at the time the heart of the city's music scene. "I just fell totally in love," he later recalled. Phillips attended the former Coffee High School in Florence. He conducted the school band and had ambitions to be a criminal defense attorney. However, his father was bankrupted by the Great Depression and died in 1941, forcing Phillips to leave high school to look after his mother and aunt. To support the family he worked in a grocery store and then a funeral parlor. In 1942, Sam, 19, met Rebecca "Becky" Burns, 17, his future wife, while they were both working at WLAY radio station in Sheffield, Alabama. He was an announcer and she was still in high school and had a radio segment with her sister as 'The Kitchen Sisters' where they played music and sang. A January 18, 2013 article in the Alabama Chanin Journal honoring Becky quoted Sam as saying, "I fell in love with Becky's voice even before I met her." Becky described her first encounter with Sam to journalist Peter Guralnick: "He had just come in out of the rain. His hair was windblown and full of raindrops. He wore sandals and a smile unlike any I had ever seen. He sat down on the piano bench and began to talk to me. I told my family that night that I had met the man I wanted to marry." They wed in 1943 and went on to produce two children in a marriage that lasted 60 years until Sam's death in 2003. Widow Becky Phillips died in 2012, aged 87. In the 1940s, Phillips worked as a DJ and radio engineer for station WLAY (AM), in Muscle Shoals, Alabama. According to Phillips, the station's "open format" (of broadcasting music by white and black musicians alike) would later inspire his work in Memphis. Beginning in 1945, he worked for four years as an announcer and sound engineer for radio station WREC, in Memphis. On January 3, 1950, Phillips opened the Memphis Recording Service, at 706 Union Avenue in Memphis. He let amateurs record, which drew performers such as B.B. King, Junior Parker, and Howlin' Wolf, who made their first recordings there. Phillips then sold the recordings to larger labels. In addition to musical performances, Phillips recorded events such as weddings and funerals, selling the recordings. The Memphis Recording Service also served as the studio for Phillips's own label, Sun Record Company, which he launched in 1952. Phillips recorded different styles of music. He was interested in the blues and said, "The blues, it got people—black and white—to think about life, how difficult, yet also how good it can be. They would sing about it; they would pray about it; they would preach about it. This is how they relieved the burden of what existed day in and day out." Phillips recorded what the music historian Peter Guralnick considered the first rock and roll record: "Rocket 88", by Jackie Brenston and His Delta Cats, a band led by the 19-year-old Ike Turner, who also wrote the song. The recording was released in 1951 by Chess Records, of Chicago. From 1950 to 1954 Phillips recorded music by James Cotton, Rufus Thomas, Rosco Gordon, Little Milton, Bobby Blue Bland, the Prisonaires and others. Sun Records produced more rock-and-roll records than any other record label of its time during its 16-year run, producing 226 singles. Phillips and Elvis Presley opened a new form of music. Phillips said of Presley: "Elvis cut a ballad, which was just excellent. I could tell you, both Elvis and Roy Orbison could tear a ballad to pieces. But I said to myself, 'You can't do that, Sam.' If I had released a ballad I don't think you would have heard of Elvis Presley." Much has been written about Phillips's goals, but he stated that "everyone knew that I was just a struggling cat down here trying to develop new and different artists, and get some freedom in music, and tap some resources and people that weren't being tapped." He didn't care about mistakes; he cared about the feel. Phillips met Presley through the mediation of his longtime collaborator at the Memphis Recording Service, Marion Keisker, who was already a well-known Memphis radio personality. On 18 July 1953, the eighteen-year-old Presley dropped into the studio to record an acetate for his mother's birthday; Keisker thought she heard some talent in the young truck driver's voice, and so she turned on the tape recorder. Later, she played it for Phillips, who gradually, with Keisker's encouragement, warmed to the idea of recording Elvis. Presley, who recorded his version of Arthur "Big Boy" Crudup's "That's All Right" at Phillips's studio, became highly successful, first in Memphis, then throughout the southern United States. He auditioned for Phillips in 1954, but it was not until he sang "That's All Right (Mama)" that Phillips was impressed. He brought the song to Dewey Phillips, a disc jockey at WHBQ 560, to play on his Red, Hot & Blue program. For the first six months, the flip side, "Blue Moon of Kentucky", Presley's upbeat version of a Bill Monroe bluegrass song, was slightly more popular than "That's All Right (Mama)." While still not known outside the South, Presley's singles and regional success became a drawing card for Sun Records, as singing hopefuls soon arrived from all over the region. Singers such as Sonny Burgess ("My Bucket's Got a Hole in It"), Charlie Rich, Junior Parker, and Billy Lee Riley recorded for Sun with some success, and others, such as Jerry Lee Lewis, BB King, Johnny Cash, Roy Orbison, and Carl Perkins, became stars. Phillips's pivotal role in the early days of rock and roll was exemplified by a celebrated jam session on December 4, 1956, with what became known as the Million Dollar Quartet. Jerry Lee Lewis was playing piano for a Carl Perkins recording session at Phillips's studio. When Elvis Presley walked in unexpectedly, Johnny Cash was called into the studio by Phillips, leading to an impromptu session featuring the four musicians. Phillips challenged the four to achieve gold record sales, offering a free Cadillac to the first, which Carl Perkins won. The contest is commemorated in a song by the Drive-By Truckers. By the mid-1960s, Phillips rarely recorded. He built a satellite studio and opened radio stations, but the studio declined, and he sold Sun Records to Shelby Singleton in 1969. In 1977 Sam's sons, Knox and Jerry, were working with John Prine at the Phillips Recording Studio when Sam Phillips joined them to oversee recordings that were eventually included on the album Pink Cadillac. Phillips launched radio station WHER on October 29, 1955. Each of the young women who auditioned for the station assumed there would only be one female announcer position, as was the case with other stations at that time. Only a few days before the first broadcast did they learn of the all-female format. It was the first all-female radio station in the United States, as almost every position at the station was held by a woman. Through shrewd investments, Phillips amassed a fortune. He was one of the first investors in Holiday Inn, a motel chain that was about to expand to a nationwide franchise; he became involved with the chain shortly after selling Elvis Presley's contract to RCA, for $35,000, which he multiplied many times over the years with Holiday Inn. He also created two subsidiary recording labels, Phillips International Records and Holiday Inn Records. He owned the Sun Studio Café in Memphis. One location was in the Mall of Memphis. Phillips and his family founded Big River Broadcasting Corporation, which owns and operates several radio stations in the Florence, Alabama, area, including WQLT-FM, WSBM, and WXFL. He also established radio station WLIZ in Lake Worth, Florida, in 1959. In 1986 Sam Phillips was part of the first group inducted into the Rock and Roll Hall of Fame, and his pioneering contribution to the genre has been recognized by the Rockabilly Hall of Fame. He was the first non-performer inducted. In 1987, he was inducted into the Alabama Music Hall of Fame. He received a Grammy Trustees Award for lifetime achievement in 1991. In 1998, he was inducted into the Blues Hall of Fame, in October 2001 he was inducted into the Country Music Hall of Fame, and in 2012 he was inducted into the inaugural class of the Memphis Music Hall of Fame. Phillips died of respiratory failure at St. Francis Hospital in Memphis, on July 30, 2003, only one day before the original Sun Studio was designated a National Historic Landmark, and just over a month before the death of former Sun Records recording star Johnny Cash, on September 12, 2003. Phillips is interred in the Memorial Park Cemetery in Memphis. Paul Eiding played the role of Phillips in the Twilight Zone episode "The Once and Future King". Phillips was portrayed by Gregory Itzin in the penultimate Quantum Leap episode, "Memphis Melody". Phillips was portrayed by Dallas Roberts in the film Walk the Line. Phillips was portrayed by Tim Guinee in the CBS miniseries Elvis. On October 21, 2016, it was announced that Leonardo DiCaprio will portray Sam Phillips in the forthcoming film based on Peter Guralnick's book, Sam Phillips: The Man Who Invented Rock 'n' Roll. Phillips was portrayed by Chad Michael Murray in the CMT drama series Sun Record. ^ Bertrand, Michael T. (April 2014). "Phillips, Sam". American National Biography. Retrieved October 22, 2016. ^ "Charles Phillips", United States Census, 1920; Oakland, Lauderdale, Alabama, United States; roll 27, page 68, line 28, enumeration district 22, Family History film 1820027, National Archives film number T625. Retrieved on 2019-03-10. As a child, he picked cotton in the fields with his parents alongside black laborers. ^ "Sam Phillips Obituary". The Times. 1 August 2003. Retrieved 6 October 2011. ^ a b "Sam Phillips". Daily Telegraph. 1 August 2003. Archived from the original on 22 October 2016. Retrieved 6 October 2011. ^ Laing, David (1 August 2003). "Obituary: Sam Phillips". The Guardian. Retrieved 6 October 2011. ^ DeWitt, Howard A. (1994). Elvis: The Sun Years. Popular Culture Ink. ISBN 1-56075-020-0. ^ Palmer, 1982, p. 219. ^ Palmer, 1982, p. 220. ^ Palmer, 1982, p. 234. ^ Olsen, Eric P. "Founding Father: Sam Philips and the Birth of Rock and Roll." The World and I. Washington, May 2001. p. 76. ^ Palmer, 1982, p. 222. ^ Guralnick, Peter (2015). Sam Phillips: The Man Who Invented Rock 'n' Roll. New York: Little, Brown. ISBN 978-0-316-04274-1. ^ Palmer, 1982, p. 225. ^ "Sam Phillips: Inducted in 1986. The Rock and Roll Hall of Fame and Museum". Rockhall.com. 2013-04-15. Retrieved 2015-09-08. ^ Olsen, Eric P. (May 2001). "Founding Father: Sam Phillips and the Birth of Rock and Roll". The World and I. Washington: 76. ^ Naylor, Jerry; Halliday, Steve. The Rockabilly Legends: They Called It Rockabilly Long Before They Called It Rock and Roll. 22:00. ISBN 978-1-4234-2042-2. ^ "The Man and the Mistakes That 'Invented Rock 'n' Roll'". NPR. 23 November 2015. Archived from the original on 22 October 2016. Retrieved 22 October 2016. ^ Guralnick, Peter (1994). Last Train to Memphis: The Rise of Elvis Presley. Boston: Little, Brown. pp. 59–62. ^ Guralnick, Peter (30 October 2015). "Elvis Presley: How Sun Records Boss Sam Phillips Discovered a Star in 1954". The Independent. Archived from the original on 22 October 2016. Retrieved 22 October 2016. ^ Palmer, Robert. "'Pink Cadillac' — A Rite of Passage". The New York Times. Retrieved 6 October 2018. ^ "Lost and Found Sound: The Stories". Npr.org. Retrieved 2015-09-08. ^ Martin, Douglas (August 1, 2003). "Sam Phillips, Who Discovered Elvis Presley, Dies at 80". New York Times. Retrieved 25 April 2017. ^ "Ownership Report for Commercial Broadcast Stations (BOA-19991130ABY)". Federal Communications Commission. December 10, 1999. ^ "Sam Phillips inductee page". Alabama Music Hall of Fame. ^ "Grammy Trustees Award list page". The Recording Academy. Archived from the original on 2015-10-02. ^ "Inductee search page". Blues Foundation. ^ "Sam Phillips inductee page". Country Music Hall of Fame. ^ "The Once and Future King full cast & crew". IMDb.com. ^ "Memphis Melody cast". Quantum Leap TV.com. ^ "Walk the Line full cast & crew". IMDb.com. ^ "Elvis full cast & crew". IMDb.com. ^ "Leonardo DiCaprio To Play Music Pioneer Sam Phillips; Launched Elvis, Howlin' Wolf, Johnny Cash & Jerry Lee Lewis". Deadline.com. Cite error: A list-defined reference named "FOOTNOTEPalmer, 1982, p. 218" is not used in the content (see the help page). Olsen, Eric P. "Founding Father: Sam Phillips and the Birth of Rock and Roll." The World and I. May 2001: 79. ProQuest. Web. 22 Oct. 2009. Talevski, Nick. "Sam Phillips". The Unofficial Encyclopedia of the Rock and Roll Hall of Fame. Pop Culture Universe. ABC-CLIO. 22 October 2009.